Last December I wrote that Guatemala “is going through a political and constitutional crisis that has everything to do with the struggle of certain sectors to retain their privileges and avoiding uncomfortable questions about them (…). But that is another story.” It is indeed, and now is the time to tell it. After three years of preparation, this past 7 January the ‘Génesis’ trial started in a Guatemalan court, against a network accused of fraudulent land operations in the Petén department, in the North of the country. By means of falsified deeds, threats and outright violence, 28 smallholder farmers were forced to sell or abandon their land to members of the Mendoza clan, that operated on behalf of a Guatemalan investor with two major forestation companies for teak wood production. This businessman subsequently bought the land from the Mendoza’s. He is currently on the run from justice, being wanted by Interpol for, among other charges, investment fraud. It would be beyond the scope of this blog to analyse in detail the nature of the fraud. Besides, the ramifications are so many that one could easily write a book about this. Let’s stick to land governance. First of all, it is important to note that these acts of intimidation concerning peasant land are normal practice in Guatemala. That this case is so well-known in Guatemala is partly due to the contribution of the International Commission Against Impunity in Guatemala (CICIG) to the investigation and evidence-gathering. 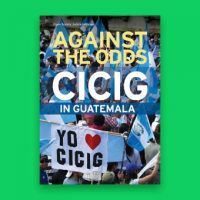 The CICIG, created in 2007 by agreement between the United Nations and the Guatemalan state, was set up to help strengthen the legal system in the country, and to research and denounce cases of corruption and impunity. One of CICIG’s work areas is land grabbing, and Génesis is a high-profile example in this line of work. But what I found really disturbing is that it turned out that employees and notaries of FONTIERRA were involved in producing forged property deeds ‘proving’ that the farmers (the ones who were not intimidated) had sold their land – which they hadn’t. It is bad enough that any lawyer would lend him- or herself to that kind of manoeuvres, but their FONTIERRA background is the cherry on the cake. As an outcome of the 1996 Peace Agreements, and with all involved parties acknowledging that land problems are among the most important ones in Guatemala, FONTIERRA was created in 1997 as a multi-stakeholder institute with the mission to address land tenure inequality and to facilitate, with different tools for market-assisted land reform, access of landless labourers and small farmers to (more) land. What’s more, the 28 farms in question were all acquired by smallholders through the FONTIERRA programme. It is, therefore, particularly ironic that staff of precisely this institute, one of the important institutions in Guatemala’s land governance system, is involved in a fraudulent scheme to take these people’s land away, committing forgery with purchase deeds. The accused have now been brought to trial, but how effective that will be remains to be seen – and that has to do with the crisis Guatemala is going through. Thanks to the work of CICIG, in the past ten years and particularly under its present director, the Colombian lawyer Iván Velásquez, many suspects of corruption, embezzlement, money-laundering and illegal financing of political campaigns, have been brought to justice. Also, the judiciary in the country has been considerably strengthened and made more independent of both the executive and the legislature. All of this is a thorn in the side of Guatemala’s elite, which is why in recent weeks President Jimmy Morales has redoubled his efforts to end the work of CICIG – that, in public surveys, has an approval rate of about 70%, in stark contrast to Morales’ 15%. In September 2018 he already had notified the UN that Guatemala would unilaterally end the cooperation agreement a year later. In passing, he did not allow Velásquez (who was abroad the time) to re-enter the country. And as if this was not enough, on the very day the Génesis trial started, the government notified the UN of the immediate end of the cooperation (not even waiting until September) and revoked the courtesy visa of CICIG’s foreign staff working in Guatemala. A coincidence, these two events on 7 January? No doubt. But what isn’t, is that both the legislature and the executive are now dismantling at high speed and by subtle and not-so-subtle manoeuvres, the independence of the judiciary, setting the clock back 12 years. It does not look good for those holding the short end of the stick, including the legitimate owners of those 28 farms. PS As a part of the institutional setting on land governance, FONTIERRAS and other actors are worth a closer look, and I will write about this some next time. For the moment, let me just say that FONTIERRA’s performance leaves to be desired: several evaluations point to the absence of results in terms of the amount of land transferred and/or purchase credits granted to smallholders. Prensa Libre: MP señala cómo la familia Mendoza despojó de tierras a campesinos del Petén. Guatemala, 7 January 2019. See, for instance: Gauster, Susana and Isakson, S Ryan (2007) Eliminating market distortions, perpetuating rural inequality: an evaluation of market-assisted land reform in Guatemala, Third World Quarterly, 28:8, 1519 – 1536; ILC National Engagement Strategy in Guatemala (2016): Monitoreo Al Presupuesto Público del Ministerio De Agricultura, Ganadería Y Alimentación y El Fondo De Tierras –Fontierras- en 2015, con Énfasis Al Presupuesto Dirigido A Las Mujeres.